Before and after. This concept is an important one. Whether we’re talking about a lifestyle change, an infomercial, or anything else. Understanding what happens after an action is taken is crucial for knowing how well that change worked. This is especially true when it comes to foundation repair. Restoring and maintaining the health, safety, and value of your home is the primary goal of foundation repair. If you’ve noticed any of these signs, it may be time to have your foundation inspected and repaired. The sooner you take action after observing any of these issues, the better. The expansive clay-laden soil in south Louisiana can wreak havoc on a concrete or pier and beam foundation. By addressing these challenges with repair and drainage solutions, you can save a lot of time and money. So once you determine that your home’s foundation needs to be repaired, what can you expect? When you use a repair method that addresses the challenges of our area’s unique soil, you can expect any and every issue listed above to be resolved. Furthermore, with a fully-transferrable lifetime warranty, you can have the peace of mind that your foundation is structurally sound. It’s also important to address any of the peripheral issues that may have led to or increased the damage. Drainage is a key consideration. Solving the problems that to the damage is an important part of the process. For over 30 years, WCK Foundation Repair has been helping owners solve their foundation and drainage issues. Using the drilled pier method, and providing a fully-transferrable lifetime warranty, WCK’s work and reputation speaks for itself. If you’re in the mood for a steak this craving is going to determine the restaurant you choose. The same is true if you are shopping for shoes, the store you end up at is going to be one that can meet your needs. At the end of the day you are going to choose a company, business or location for several reasons; but the most important reasons will be that they can meet your needs and they can do it better than someone else doing or selling the same thing. This couldn’t be truer for foundation repair. If you discover that your home has foundation damage choosing the right foundation repair company is a critically important decision. Here are several things to consider before you hire a company. Employees: Many companies subcontract workers to complete jobs. This is a cheaper alternative. Unfortunately, this means you will likely have someone with little to no foundation experience working on your home. Ideally you will want to have company that has full time employees with plenty of experience. Franchises: Large foundation repair companies will sell franchises to local owners. The problem with this set up is that the owners are trained at a corporate location on methods and in conditions that don’t match the unique soil and challenges we have in south Louisiana. Method: Again, depending on the type of company you hire, they may not have the skills or resources to adequately repair your foundation. The only effective method in our clay-laden, expansive soil is the drilled pier method. Many companies use different methods that work well in other parts of the country, but not here. Quote: Just because a quote is low doesn’t mean it is the best. Unfortunately some companies will offer low estimates to win a job, but this means they will only be doing part of the work that is necessary. So instead of have a complete repair, only part of the foundation is repaired, meaning you’ll have more issues in the future, and will likely end up paying much more in the long run. Licensing & Insurance: This is very important. Whenever you have someone working on your home you need to ensure that they are licensed with the Louisiana State Board of Contractors and carry insurance. These are only a handful of key elements to consider when you hire a foundation repair company. A trusted, local and knowledgeable company should be able to answer all of these questions and many more for any homeowner. For over 30 years WCK Foundation Repair has been a family owned and operated company that proudly has a staff of full time foundation repair experts. . WCK also exclusively uses the drilled pier method, and stands behind all of their work with a fully transferrable lifetime warranty. Their Louisiana license number #47199, they are accredited by the Better Business Bureau, Angie’s List Super Service Award winners and a Capital Region Builder’s Association member. When it comes to your home’s value and safety, trust the company and people that understand the science and nature of foundation problems and care for the communities they help. Being from South Louisiana food plays a major part in our lives. We have crawfish season, tailgating and some of the best restaurants in the world. This makes us skeptical when we visit other parts of the country. A Cajun/Creole restaurant in Wichita, Kansas? Crawfish in Colorado? Jambalaya in Ohio? There are some things that, no matter how hard you try, unless you’re from here you just won’t understand. Foundation repair is the same way. The soil that we build our homes and businesses on in the Baton Rouge area is unique. In fact it is even unique to the soil in the New Orleans area and coastal parishes. The capital region, spanning east past the north shore of Lake Pontchartrain is comprised of a clay-laden, expansive soil. This soil type requires a specialized method for foundation repair. Like most things today, when you have a concern or question about something you probably consultant Google. If you are trying to determine which foundation repair company to choose, it is not only a good idea, but crucial that you dig a little deeper for information on these companies. Just as you wouldn’t want to visit a restaurant with a note from the health inspector on the window, or order a plate of crawfish etouffee from a chef that was born and raised in Minnesota; you don’t want to entrust the health and value of your home to a company unfamiliar with our unique natural conditions or a company with a sketchy track record. The unfortunate truth is that of the handful of foundation repair companies in our area, few can offer local experience, expertise and trust. Some companies are specialized to the conditions of the New Orleans area. These methods don’t work well in our part of the state. Others have very poor reviews from the Better Business Bureau. While others are based several states away and lack the knowledge that is necessary to perform a quality repair on our homes. Often times these “foreign” companies don’t even possess a local license to work in Louisiana. For over 30 years, WCK Foundation Repair, licensed and insured, specializes in the only proven foundation repair method for our region, the drilled pier method. This process is so effective, WCK backs their work with a fully transferrable, lifetime warranty. With a dazzling BBB record and a handful of Angie’s List Super Service awards, WCK has been educating and helping our community for decades. If you think you may have foundation damage, click below for a free resource on the common signs of foundation damage. For more information from WCK, click here. For every business the most important thing is the people. In a restaurant you can have the nicest tables, chairs and silverware, but if the cook doesn’t know what he’s doing and the waitstaff is rude, how long will that restaurant stay open? Same thing for a car dealership. The shiniest, fastest car with a low price is no match for an annoying salesman and a service department that can’t rotate tires. These are only a few examples of how people can make or break a business or a customer’s experience. What about when you invite someone into your home to provide a service you absolutely need? When it comes to foundation repair the end result is only as good as the crew that is making it happen. The transition that takes place from when you receive the estimate to the day the equipment arrives to the day your foundation is restored should be a seamless one. Unfortunately, for far too many foundation repair companies, this isn’t the case. In an effort to keep costs low more and more companies are using contract workers. The problem here is that these workers don’t have anything invested in the project. The day before they could have been fixing a roof or painting a house, tomorrow they’ll be somewhere else. Foundation repair is complex process. The knowledge and ability to do the job correctly comes from the understanding of what is causing the damage, and how to effectively correct it. More often than should ever happen a job becomes more complicated than originally perceived and, as bad as it sounds, a company will actually abandon the repair. Local companies have a vested interest in providing the best service possible. This is the place where they live and call home. At WCK Foundation Repair, for over 30 years, full time employees have been the ones to visit your home and repair the damage. With a thorough understanding of south Louisiana’s unique soil and a commitment to restoring your home’s value and safety, the perils of fly-by-night crews and less than trustworthy estimates are never a concern. If you suspect that you may have foundation damage, let the local, trusted experts at WCK Foundation Repair help. Our crew does this every day and sees each job to its satisfied conclusion with a fully transferrable lifetime warranty. For more information about the signs of foundation damage and to contact WCK Foundation Repair, click here. As time goes by the way we treat, repair and in general, fix things continues to change. Whether it’s a hack to use every day, household items to make our lives easier, or a technological or scientific advancement that helps us travel faster, see more or diagnose and cure things we couldn’t in the past; we continue to evolve and improve things we’ve been doing for years. The same couldn’t be truer for your home’s foundation repair. Over the past 30 years of learning about the conditions that damage foundations in our part of Louisiana, and devising the best method, new efficiencies, processes and prevention tactics have been discovered. This is great news for you, the Baton Rouge homeowner, who one day may be faced with foundation problems. Issues that were once complex, have become simpler, equipment that didn’t exist, even a decade ago, now does; and repairs that could have been quite expensive, no longer have to be. Just as there have been strides made from 15, 10 and 5 years ago to today, the rate of technology will only increase these advancements going into the future. This is a key reason why it is so important to read, review, understand, maintain and sign your contract when you agree to foundation repair. Just like any major purchase or agreement, there will be some expectation of due diligence. Just as a car manufacturer likely won’t honor a warranty if you never change your oil, there will likely be preventative measures and maintenance that need to be done after your foundation repair is made. In order to protect the repair and your home, it’s imperative you understand your responsibility, and that will be spelled out in the contract. Reading over the contract will also give you a tangible description of the work being done. While this can be a stressful time, knowing the process from start finish and understanding what to expect, can make it much easier. It is also a great opportunity to find out exactly what you are paying for. Many companies, unfortunately, take advantage of a stressful, complicated situation and can: overcharge, under repair, misdiagnose or a combination of all three. A thorough review of the contract and asking questions is great way to avoid future headaches. WCK Foundation Repair, after 30 years of refining and implementing the drilled pier method, the best method for south Louisiana’s expansive soil, is still finding ways to improve and help home and business owners in our part of the state. And just like our contracts from the 1980’s aren’t relevant to the contracts we have today, our current contracts and information will evolve going forward as well. If you think your home has foundation damage, check out the 7 signs of foundation of repair. For more information, click here. If you have a toothache you have a few options. The first one that comes to mind is to go see a dentist. After years of education and training, he or she has been specially and specifically prepared to examine, diagnose and treat teeth and your overall oral health. You could also tie one end of a string around your tooth and the other to a door knob and slam the door. Sure one will be dramatically cheaper than the other, but which will likely be more effective and in your best interest? The same is true for hiring a licensed foundation repair company to see to your home’s foundation problems. You can likely find a lower estimate from an unlicensed company. You’ll also likely find that you’ll have more problems in the future, paid too much for what little work was done and have no recourse to protect yourself against these types of companies. However, with a licensed, bonded and insured Louisiana foundation repair company you will be able to trust that the governing bodies of the state stand behind, support and approve of these companies doing business on your home. These are also companies that take the practice, education and technology of what it takes to repair, restore and protect your home very seriously. WCK Foundation Repair has been helping homeowners for over 30 years. Their proven drilled-pier method is the ideal process for protecting south Louisiana foundations from the impact of the soil in our region. Not only does WCK care about these homes and the people that live in our communities, they stand behind their work with a fully transferrable lifetime warranty. For more information on foundation repair, click here. Experience is one element that can’t be taught. No matter how hard you try or how quickly you learn, having years of lessons and occurrences and events to fall back on is an irreplaceable asset. Whether you are entrusting someone to change the oil in your car, mow your yard, cut your hair or restore the safety and value of your home, having a team of skilled, experienced, knowledgeable professionals is the only way to go. Unfortunately what happens more often than not, as companies look to save money, they are left with inexperienced employees. This is especially true for the average construction company. Filtering through employees is commonplace. This is unfortunate because, while the market is still good for these companies, the only person that suffers from this trend is you, the customer. The goal of most companies, again unfortunately, is to finish a job as quickly and inexpensively as possible. One of the easiest ways to trim expenses and increase margins is though hiring less experienced workers that command lower compensation. As newer employees come through the company and handle your project, the likelyhood for errors dramatically increases. When it comes to something as important and intricate as your home’s foundation, leaving the structural integrity of your home in raw, untested hands is less than an ideal circumstance. The precise methods and processes required to restore your entire home, with lifetime quality and protection are not something that can quickly learned or taught. When it comes to your home, you deserve the best, most skilled and experienced people utilizing the best method for our south Louisiana homes and soil. A job can only be done as well as the people doing it are skilled and the method employed is proven. WCK Foundation repair not only uses the only proven method, drilled-pier, to effectively correct foundation issues in our expansive soil, but are proud to have a long tenured team of professionals. The driller/installer experts have over 21 years of experience using the equipment and machinery necessary to completely repair your foundation. With a focus on sound, quality craftsmanship and a commitment to experience, WCK is dedicated to not only the restoration of your foundation, but educating and improving southern Louisiana. If think you have foundation issues, trust the experienced team that stands behind their work with a fully transferrable lifetime warranty. Click here for more information. So you’ve noticed some sticking doors and windows. Walking through your yard after a rain shower, you step in some standing water. That crack on the wall by the garage has definitely gotten bigger. You recognize the signs of severe foundation distress, and now you’re ready to do something about it. As any savvy shopper would, you collect bids from different foundation repair companies. As you look over the estimates, there is one that jumps out at you, because it is substantially less than the rest. Remember, if it sounds too good to be true…it probably is. Unfortunately, this happens often enough that there is a name for it, “foot in the door” bidding. Now these contractors aren’t unique to foundation repair. You’ll find plumbers, painters, roofer and general contractors that try the same ploy. However, when dealing with something as vital to your Zachary home’s health, safety and value as its foundation, these bids should set off a major red flag. Here is a text book example of how these scams go. Company A claims that only a partial area of the foundation needs work. So instead of ensuring the health of your entire home and foundation, they fix a fraction of the problem, disguising it as repairing your entire foundation. They enter the negotiations knowing that a quality, reputable, professional foundation repair company in south Louisiana will quote a much higher estimate. These prices may very well be out of your price range. However, assuming you are getting the same value for a fraction of the cost, it makes sense. They also may be stair stepping the cost by only charging and completing one aspect of the repair at a time. Knowing for example you have at least $10,000 worth of repairs that need to be done, and offering to fix something for $2,000 will get his “foot in the door”. Meanwhile, planning to comeback in the future and offer to remedy another issue for another nominal fee, so on and so forth. When you make that decision to repair your foundation it cannot be overstated how important it is to select a reliable, respected repair company that will not only repair the damage, but educate you in the process and stand behind their work with a lifetime warranty. 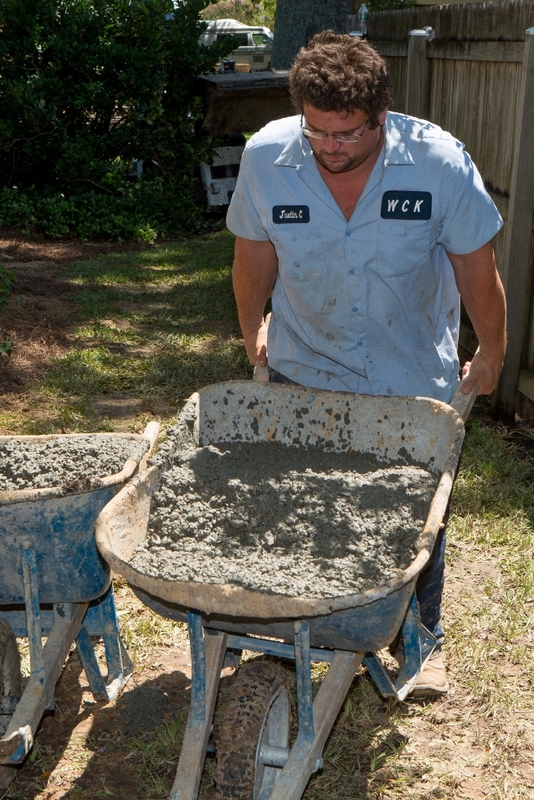 WCK Foundation Repair has been caring for south Louisiana foundations for over 30 years. They have developed and exceled at the ideal repair method for Baton Rouge and North Shore soils. Remember that foundation repair isn’t as simple as adjusting one corner of your home. If uneven soil expansion, rotting beams, poor drainage or plain old bad construction is affecting one area of your foundation, it’s likely affecting all of it. You deserve a full solution to the entire problem. Foundation repair can be overwhelming for many. There is often uncertaintity and concern over the cost of the repair, how long it will take, and if it will be done correctly. Great care should be taken in selecting a company that is reliable, reputable, and honest. When considering how they may care for your home, there is no greater way to measure a company's dependability than by the satisfaction of their past customers. How many companies provide potential clients with references? Only the good ones. It doesn’t mean that every job was done perfectly. In fact, as is the case with most construction jobs, there will sometimes be miscommunications or errors made. But what separates a reputable company from one that you should avoid is how the customer was treated throughout the process. For this reason, WCK Foundation Repair maintains an extensive reference list. We have repaired thousands of homes in the Baton Rouge and surrounding areas, and we have many references available from those jobs. We even have a standard list of satisfied customers who have requested to be used as referrences, along with their contact phone numbers. Additionally, WCK goes the extra mile with the ability to provide references which are located nearby your own home. We realize that it may be important to you to have a referral from someone in or around your neighborhood, so WCK does the extra research to ﬁnd these customers for you. Of course, we value the privacy of all of our clients and will always obtain permission before giving out phone numbers. We strive to make all of our customers, both past and future, happy. We also understand that some clients like to see our crews in action before their job begins. For that reason, we even provide addresses where repairs are underway, so you are able to see work as it is being completed. As long as you keep within a safe distance, you can stop and visit one of our worksites anytime. This will give you a good idea of what to expect, while also being able to see our great employees at work. If you are considering a foundation repair in the Baton Rouge area, contact WCK Foundation Repair for our references. We understand that this may be a stressful process for you. Our goal is provide you with quality work and peace of mind.